For-profit universities are attracting controversy almost as fast as they are attracting students. Wall Street likes the business: low barriers to entry, high profit margins, and product lines that can scale up. Looming threat: increasing government scrutiny. But there's no denying the rise of these institutions and the change they are forcing on traditional colleges and universities, which already were recognizing the need to adapt to online learning and the needs of older learners. So just for fun, what name would your pick for a for-profit university? The Franciscan U of the Prairies became Ashford U. Beaver College became Arcadia University. Trident University became Trident University International. For profits aren't alone in changing names, as US News reported back in 2009. (And wait a minute....didn't US News itself have a longer name? Oh, yeah. It's clear that for profit institutions want a name that conveys a strong brand, rootedness, quality, good experience. Harvard is taken, though Harvard itself had no name till a donor by that name left money. Duke went through several names before accepting a tobacco fortune. So I'm thinking of a name that conveys lively people, a gorgeous campus, well-dressed leaders, upwardly-mobile boarders, cool clothes, a nearby pub, a great library, a regal dining hall and, one must have, fox hunting. For differentiation, you need the unique quality of full pursuit of the uneatable. 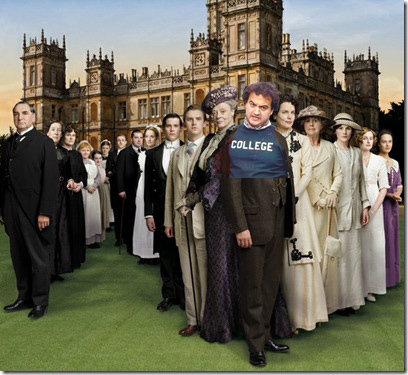 I'm calling it Downtown Abbey University. The name says urban and rural, plus people find the campus life irresistible to watch.